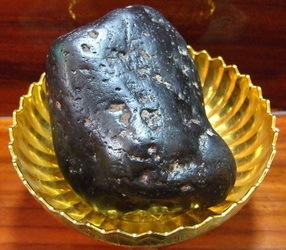 Lek Lai is a Mysterious Sacred substance which is the subject of Legendary Tales of Miracle Powers which has become a Cult Phenomenon in recent years, due to the ease of access to information enabled by modern Media such as the internet, as well as being due to increased International trading and a massive increase in Thai Buddha Magic. Lek Lai used to be presented in only a few forms, shapes and sizes. 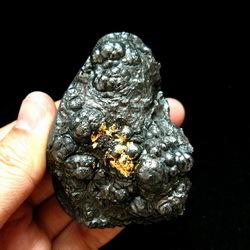 Now however, there are literally hundreds of different looking substances which those who market them consider to be Lek Lai, or Lek Lai derivatives. Lek Lai has been used as an ingredient for mixing into amulets for centuries, as well as being used as a magical element in its own right. 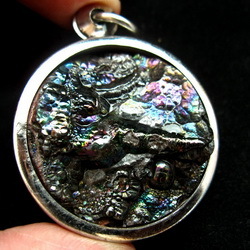 Lek Lai is a metallic element with a life of its own. It is also Karmic effect of Spirits which have been driven by the winds of karma to be reborn in Samsara in the form of metallic elemental substances, and is subject to having to eat (honey) and excrete (Khee Lek Lai) residue. The Lek Lai is considered a living being of the Deva classification (Angelic Deity). A Deva that has been driven to be born on Earth. There are both ‘Kon Tan’ and Yaksa type Devas found inhabiting Lek Lai, which gives each different Lek Lai its own special powers and properties which differ with each inhabiting Deva. Lek Lai is something which will protect who carries it from guns or sharp objects (such as knife or sword), and all other harmful weapons. Some people believe that Lek Lai is indestructible and immortal (Adamantine). I myself would comment on this belief that the Lord Buddha already expounded the Dhamma to be based on the three Truths of Impermanence, Dhukkha and Non-Self. All material things are subject to change, and eventual dissolution. It seems unreasonable to believe that Lek Lai should be any different from all other worldly Dhammas. Matter can not be destroyed, but it is constantly changing its form. If the changing of form is not considered to affect the immortality of an object, then we could also say that the human body is immortal, simply that it has changed form into, slime for example. All things with a beginning have an end, even this planet and solar system will one day end, and then at the latest, the Lek Lai will also end. This is the way things should be, for development is reliant on change, and liberation is reliant on the destruction of ones limits (the body).